Next Tuesday will see the Census Bureau’s annual release of data on earnings, income, poverty, and health insurance coverage for 2016, which will give us a better picture of how working families are—and are not—recovering from the Great Recession. While it may seem a bit odd to still be talking about recovery a full 9 years after the Great Recession started, even as of 2015 median incomes for American households still had not gotten back to their pre-Great Recession peaks. Worse, in the full business cycle of 2000-2007, household incomes never fully recovered to the pre-recession peaks reached in 2000. This means that the slow early-2000s recovery and expansion, combined with the damage done by the Great Recession, has led to nearly two decades of lost income growth for typical American households. Next week’s release will help us chart the progress in clawing back these lost decades—paying particular attention to differences in the recovery across racial and ethnic groups. Last year, annual earnings and household incomes rose significantly for the first time since 2007. At the same time, the official poverty rate sharply fell. These long-awaited and impressive across-the-board improvements were welcome news after the lengthy downturn. Furthermore, most of these gains were experienced by workers of both genders and workers and households of all races and ethnicities. Despite these significant improvements, by 2015 household incomes had still not fully recovered from the deep losses suffered in the Great Recession. One more year of modest growth should bring the broad middle class back to pre-recession incomes. It is important to note, however, that some of the improvements we saw last year were driven by very low inflation (0.1 percent), mostly due to falling oil prices. While still low by historical standards, inflation was 1.3 percent between 2015 and 2016, which should moderate some of the gains expected in next week’s report. Given the data we’ve seen for 2016 from other sources, improvements are likely in the Census release. Hourly wage data suggest that wage growth was more evenly distributed between 2015 and 2016. While strong growth continued at the top, we saw promising growth at the middle and bottom as well. Median wages grew 3.1 percent, while the 20th percentile experienced a striking 6.4 percent increase and the 10th percentile increased 2.9 percent. These indicators suggest we should continue to see improvement in the earnings, income, and poverty data. On Tuesday, EPI will examine the data on median earnings, by gender, race and ethnicity. We’ll look at changes over the last year, as well as changes since before the Great Recession, and since 2000—the last business cycle peak that can be confidently associated with something close to genuine full employment. Women working full-time, full-year have already exceeded their annual 2000 real earnings level; the hourly wage data indicate a return to near-2007 pre-recession levels of earnings for men in 2016. We’ll also analyze these changes by race and ethnicity to understand how the economy has treated demographic groups. Again, the hourly wage data are likely the best predictor of what we can expect for these groups. (For a taste of these comparisons, check out EPI’s State of Working America Data Library.) We will also analyze gender and racial wage gaps to see whether we’ve made any progress in closing these. In addition to looking at how median household income growth differed by race and ethnicity, we will also examine changes in incomes across the income distribution. Specifically, we will be presenting the growth in income by income fifth and the top 5 percent to make an assessment of growing or shrinking inequality over the last few years. Unfortunately, again, the hourly wage data through 2016 indicate a growth in wage inequality—among men in particular—and therefore likely a growth in income inequality. Last year, while there was broad-based income growth, it was only the top 5 percent that exceeded their pre-recession income levels. Third, we will provide an analysis of recent trends in poverty. Similar to the previous discussion, we will analyze poverty in 2016 and then make comparisons to 2007 and 2000. We’ll also look at poverty by race and ethnicity, and separately for children—who tend to have particularly elevated levels of poverty. As incomes rise, particularly when there’s broad-based growth, poverty will hopefully continue to fall. It is important to remember that the data reported next week is for 2016. Given this, the data do not reflect anything, for good or bad, about policies enacted after that year—so the current administration’s policies just won’t be influencing this data at all. That said, the data do provide useful insights into the role of policy in improving incomes, particularly in reducing poverty, and this can inform us about likely effects of changing these policies. For example, the Supplemental Poverty Measure (SPM) will also be released on Tuesday. The SPM is an alternative to the long-running official poverty measure that attempts to correct some of the weaknesses of the official poverty measure (e.g., the fact that it counts only cash income, and often sets possibly too-low thresholds for poverty, due in part to its lack of geographic variability.) Because it includes non-cash measures of family income, such as income from social security and tax credits, the SPM lets us assess how well public assistance and safety net programs are lifting people out of poverty. As illustrated below, without important government programs, millions more would be in poverty. In the absence of stronger wages growth for low and middle-income workers, safety net programs play an increasingly important role in helping struggling families afford their basic needs. On Tuesday, we will take a deeper look at these SPM data to make an assessment of how poverty, as measured by the SPM, has changed in the recovery and the importance of shoring up not tearing down these programs in future policy making. 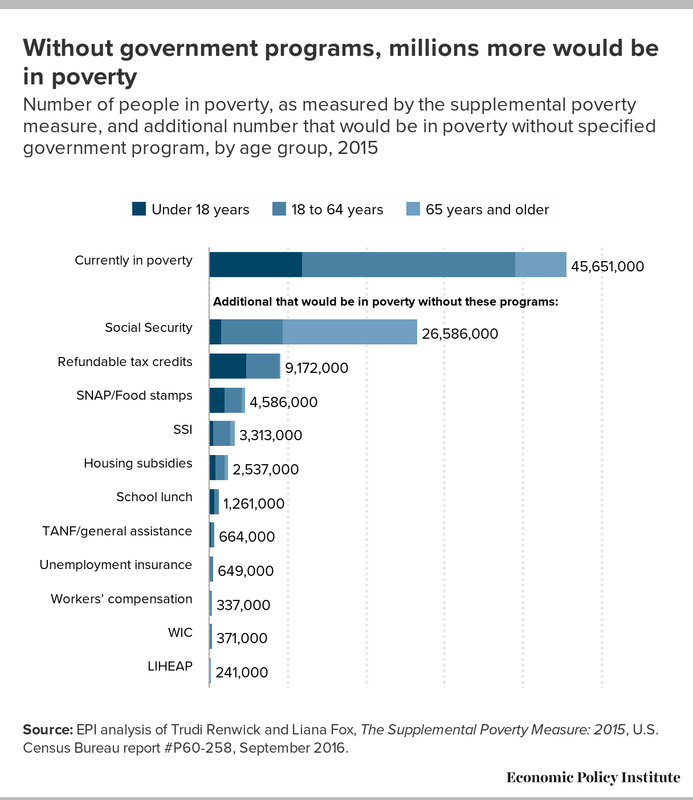 Source: EPI analysis of Trudi Renwick and Liana Fox, The Supplemental Poverty Measure: 2015, U.S. Census Bureau report #P60-258, September 2016.